Overview – The Molicare Mobile Extra is rated for heavy coverage. It features a lower waistband with extra elastic to hold it in place and guard against slipping. The waistband is cloth-like which is breathable, comfortable and helps keep the skin dry. It also has an inner cuff systems that helps maximize leakage protection. There is a graduated wetness indicator. Absorption – The Molicare Mobile Extra has a 3 layer absorbent core. This core guides the fluids quickly into the center core, locking both urine and odor safely inside. The wetness indicator will allow you to see how close to capacity you are. Fit – The Molicare Mobile Extra is a pull on style product. It features a lower fitting waistband that is wider for a comfortable fit. There are inner leg cuffs for prevention of leakage. Odor Reduction – Because the Molicare Mobile Extra has the super absorbent core, it neutralizes any odor and contains the urine within the core. It locks both urines and odor safely inside this core eliminating any odor. Additional Products – For overnight use, you may need to add booster pads. These add to the capacity of the product. For added protection for your furniture or mattress, you may want some underpads. They are available in disposable or reusable styles in a variety of sizes to fit your needs. Some people like the added protection of cover-ups. These are waterproof covers that go over the actual incontinence product. They are reusables, and machine washable. Suggestions Alternatives - Style and Also Bowel - If you prefer the diaper with tab style, there is Molicare Premium Soft Super Brief with Tabs. While some prefer the pull on style, others have found that the diaper with tabs is easier for them to use. For bowel incontinence you might want Tena Discreet Protective Underwear. The Molicare Mobile Extra is not designed for bowel incontinence. Note that the Molicare Mobile Extra are more expensive, but they are also more absorbent than the Attends and McKessons. Is this a better product than the store brands I already get? Why can't I find this product at the local store? This product probably is not available in your local store. It is a higher capacity product than those at normal stores. Due to supply and demand, they do not carry them. With incontinence products, there is a tendency to get what you pay for. In other words, less expensive usually means less effective in containment. Most of the higher capacity products just don't have the demand to be found at a department store. We can supply you with the product you need and have it delivered to your door. Can I make adjustments for a better fit with this product? This is the pull on style product. They feature elastic at the waist and leg openings. These will bring the product snug up to your skin. The elastic helps them to stay and place while being a comfortable product to wear. If you find you need to make the product tighter, you should try the Molicare brief with tabs. This product works great for my daytime use, but I seem to need more at night. Any suggestions? Some people need extra coverage or capacity at night. This is when you muscles relax more and there is more output. If you find you need more capacity from this product you can add booster pads. This will add from 4-16 additional ounces of fluid retention. Do I need to use the same product all the time? Why is this product more expensive than what I use right now? As stated in a previous FAQ question, you generally get what you pay for in incontinence product with a little bit of leeway. This is a higher capacity product with good features that works well for many people. If you are looking for something even more fantastic, try the Tranquility Premium Overnight Pull-ons. About Hartmann USA– Hartmann USA, also called Molicare or Dignity began in 1949 as Connecticut Bandage Company. In 2001 it was acquired by Paul Hartmann AG. It was renamed Hartmann USA in 2008. In their incontinence product division they offer reusable and disposable underwear and diapers with tabs. Also offered are pads, and underpads. They are constantly looking for ways to improve their products. They believe in passion (for their products), partnership (to help those in need of their products) and professionalism (they are serious in what they offer). This product ships from the warehouses we utilize within 1-2 business days. The delivery time is determined by the distance you are from the warehouse. It can be as soon as next day or 2-3 business days. We ship out as quickly as possible. You will need to contact us in regards to returns. This Molicare product ships by case only at this time. The case has to been unopened and complete in order to do a return. Returns must be within 30 days of shipment. There is a 15% restocking fee and a $9.99 return shipping fee that is deducted from your credit back to your card or used payment method. We do stand behind the products we sell. We want happy customers. We will swap out any defective packs or cases, and we try to ship out as swiftly as possible. If you have questions or problems with your product, please email us or call us at 866-559-0353. We will be happy to assist you in finding a solution or answer. We do auto reorders for any of our products. We ship the product when you want and what frequency you want, then charge your credit card on schedule. You can make changes up until the order is released. By signing up for the auto reorder, you receive a 1 year price lock on the product you order. Your price will not go up for one full year. You choose date, frequency, everything. The products come right to your door without hassle. See our auto-reorder page, email us, or call us at 866-559-0353. Discreteness and Quietness– This product is sold by case quantity only at this time. It will ship in the case that it comes in from the manufacturer. These are generally plain brown case boxes. There will be a packing slip and address label. No where does it state what is inside the box for others to see. This product uses cloth-like backing and is quiet to wear compared to a noisier plastic backing product. 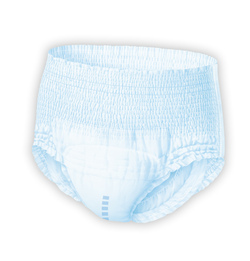 I have heavy incontinence and these diapers offer great protection against leaks. To me the possible embarassment of a bulkier diaper or the purple plastic is not as bad as wearing a leaky diaper. I've experienced that before. Excelent for all day protection against Heavy loss of Urinary control. allows me to go an entire shift at work without a change. The item shown is excellent. These items work very well the user is a heavy urine person. She can't get up that much and by the time she tells someone that she's wet the diaper is pretty full. We tried numerous others with her and these are the only ones we've found that hold the fill 99.9 percent of the time. This is going both ways.